Ajax produced a stunning second-leg performance for a second straight round, as it came from behind to beat Juventus 2-1 on the day and 3-2 on aggregate to reach the semifinals of the Champions League for the first time since 1997. After a 1-1 draw in the first leg, a Cristiano Ronaldo header put Juventus ahead in Turin, but Donny van der Beek leveled before halftime to even the series on aggregate and away goals. Ajax had beaten Real Madrid in similar circumstances in the previous round and produced another inspired road showing, overwhelming Juve in the second half and winning thanks to a towering header from 19-year-old captain Matthijs De Ligt. In the night’s other game, two goals from Lionel Messi and a Philippe Coutinho screamer ensured Barcelona progressed to the last four with the minimum of fuss against Manchester United, with a 3-0 win on the night securing a 4-0 aggregate success. It shouldn’t be possible. In the modern age, everything is stacked against teams from outside the big five leagues, yet Ajax, for the second series in a row, produced the sort of performance, one full of bright, brave passing, that lifts the heart. There is, perhaps, a particular beauty about this side because of the certain knowledge it cannot last. The financial might of the superclubs beckons, leaving a club like Ajax fragile, doomed to be broken up–if not this summer, then certainly the one after. Frenkie De Jong’s move to Barcelona has already been agreed upon, and with him the exodus will begin. There's vast speculation that De Ligt will join him. Enjoy it then, while it lasts. Ajax was, again, sensational. The pace and fluency of its passing was mesmerizing, and it could've been a more lopsided result if not for Wojciech Szczesny's two excellent second-half saves. A welter of chances were missed. Juve couldn’t get close to it, reduced early–not that it takes much–to brawling and moaning. What makes this Ajax team so special? Goal-scoring hero and 19-year-old captain Matthijs De Ligt joined Planet Fútbol TV to tell us. When Juventus paid $126 million to sign Ronaldo, plus $135 million over four years in wages, it was with the intention of winning the Champions League. After so many near misses, his goals were supposed to be the final ingredient to carry the club over the line. But it has not worked out that way, at least not yet. Adding Ronaldo has brought additional firepower. At 34, he remains a player who scores vital goals. He scored a hat trick against Atletico to turn the last-16 tie around. He scored the first goal in both legs of this tie. But at what cost? With Serie A such a one-horse race these days, the test of the Ronaldo signing was always going to be the knockout phase of the Champions League. And while Ronaldo has scored five goals in four of those games, Juventus has lost two of them. It was well beaten in Madrid by Atletico, was outplayed in Amsterdam in the first leg and then was thoroughly outplayed in the second half vs. Ajax at home. 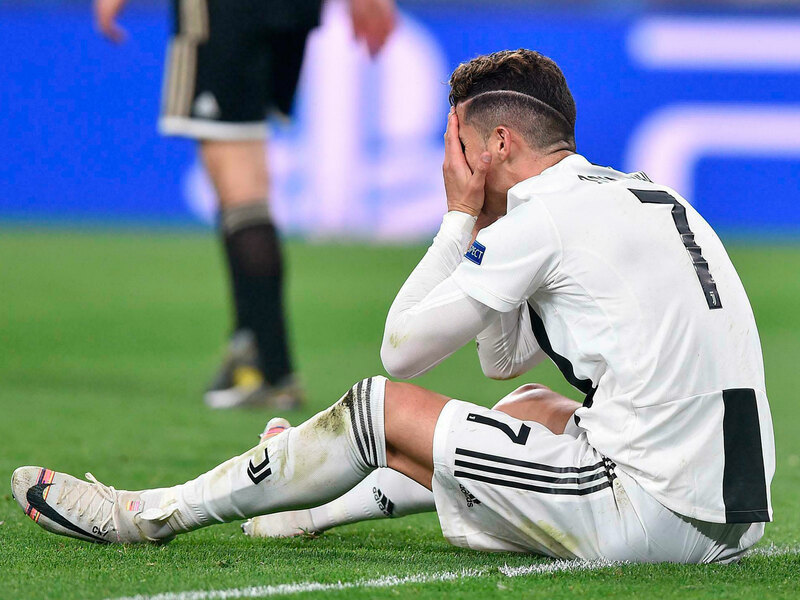 Ronaldo’s petulant chop at Joel Veltman in the final minute, which drew a yellow card, was the perfect summation of a season that has not gone as he or Juve would have wanted. Barcelona is not 10 players plus Messi, but it is far closer than any team at this level really should be. It's not just that he scored two goals, or that he tormented United’s aging back four, it’s how poor Barcelona was until he got going. The first quarter hour was hugely encouraging for United. It pressed high and, as had been the case in parts of the first leg, Barcelona’s passing went awry. Marcus Rashford hit the bar in the first minute, and there were a number of half-chances or potential moments for chances as United’s forwards got a run at the back four. As Chelsea and Roma showed last season, this is not a Barcelona midfield that offers a huge amount of solidity. But then Ashley Young, attempting a Cruyff Turn, was dispossessed by Ivan Rakitic. Messi got to the loose ball first, wobbled by Fred and, mystifyingly shown onto his left foot by Phil Jones, clinically whipped his shot just inside the left-hand post. The change in mood was palpable. Even though United, as it had at the beginning of the night, required two goals to go through, it looked beaten. Messi’s second, which squirmed under David De Gea’s body, effectively confirmed that. For Ole Gunnar Solskjaer, who has now lost five of his last seven games, there must have been intense frustration: he had set the side out in a shape and with a method that unsettled Barcelona but was undone by the brilliance of perhaps the greatest player of all-time and a series of individual errors. With a three-goal cushion, Barcelona played with swagger and verve and United struggled to get the ball back. In those opening minutes, though, there were worrying signs. This is not the Barcelona of 2009 or 2011, or even of 2015. That midfield is porous, the forward line doesn’t do a huge amount of defensive work and the side as a whole can be stretched. Barcelona was obviously the better side in the tie but it is far from unbeatable.